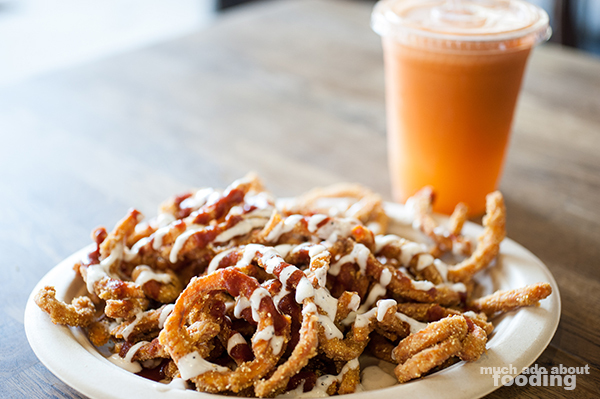 Do you ever get a craving for vegetarian or vegan food? I do. 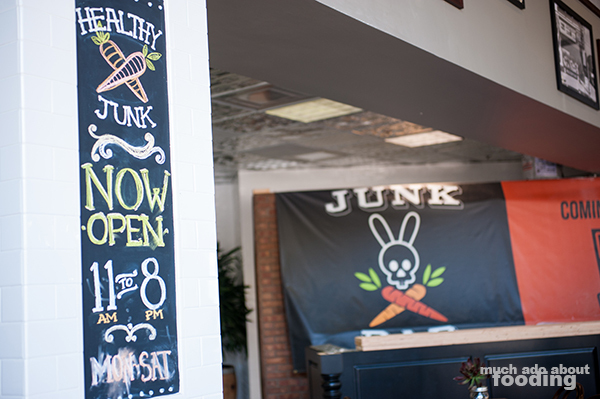 If you don't, you probably will after noshing on some tasty dishes from Healthy Junk. As I try to be more health-conscious, I am finding that it has been difficult to find places that do meatless dishes well. My friend had this place bookmarked to try out so we decided to visit it one day for lunch. It's located in an area where I had no idea restaurants and other small businesses existed but it does look like an up and coming spot: the Center Street Promenade in Anaheim. In the same area there was a 118 Degrees, a yoga mat, a sign for an upcoming cheese shop, and other neat boutiques. 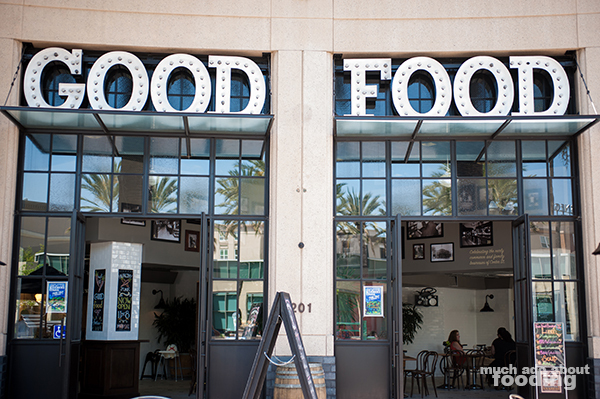 Healthy Junk itself was housed in a corner section of a building with bold letters proclaiming "GOOD FOOD" inside. There were two other restaurants within but it was easy to spot the fruit and veggie-oriented restaurant that set itself up like just a fruit stand. 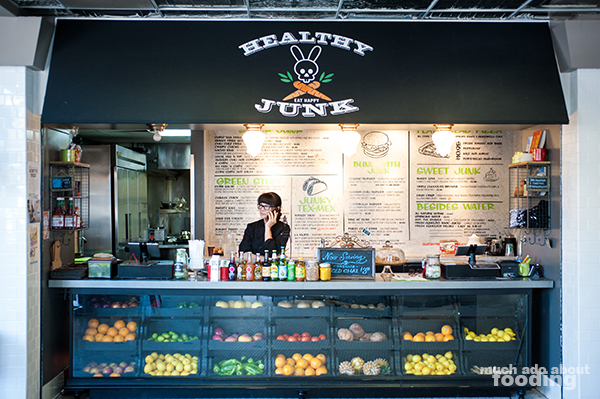 The fatalistic bunny skull in their logo told me that I would like this joint and the interior decor confirmed it. There being so many options, I found it hard to limit myself to just one thing (by the way, you can view their menu online!). Of course this resulted in perhaps some overspending and certainly take-home boxes but who cares? It's good for you right? 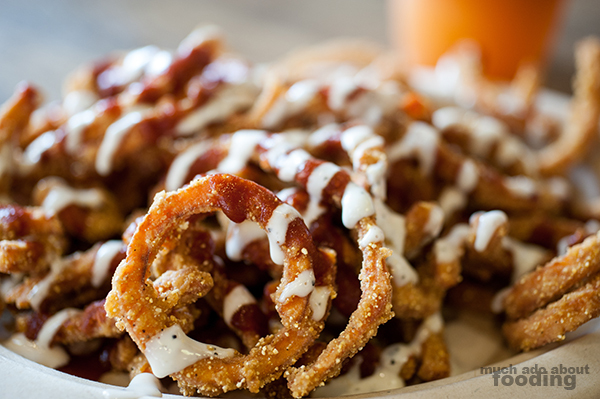 My starter was their Curly Yam Fries ($4.95 - a mountain of crispy yam fries drizzled with ranch and BBQ sauce), a cornmeal-crusted concoction that I wish I had separated from its sauce. I'm not saying the sauce wasn't good; I'm just saying that there were a heck of a lot of fries and reheating these bad boys with the sauce on was not tasty. Fresh, though, these were a fantastic alternative to the ubiquitous sweet potato fries everywhere else and in a different shape as well. With cornmeal as the crust, it didn't need nearly as much deep frying as one might expect. My friend opted for their K Chips (kale tossed with olive oil and sea salt, baked to a crisp and served with ranch), a surprisingly well-done dish that had us both talking about our own failures at making such perfect snacks. 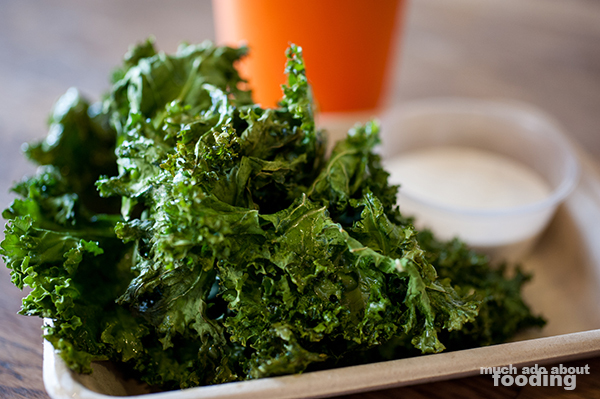 Somehow Healthy Junk managed to turn these kale leaves into crisp wisps of flavor. How did they crumble in our mouths so readily? They were hardly chips as much as they were teases of culinary expertise. I found them tasty and the right texture to cry, "Sorcery!" at the excellence. In addition to our starters, we also got juices to sip on - hers was a carrot orange and mine a carrot-apple-ginger. Refreshing! 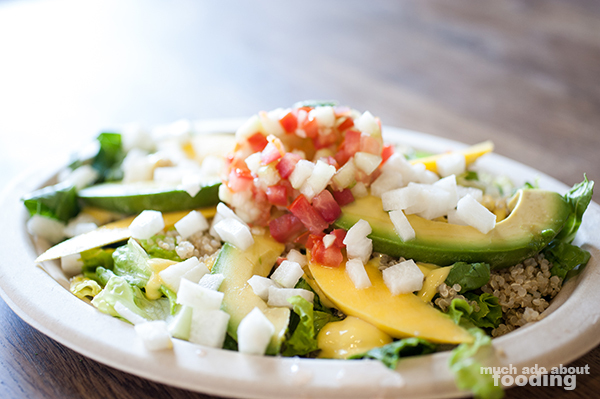 The entrees are in categories of salads, burgers, Mexican food, or flatbreads. 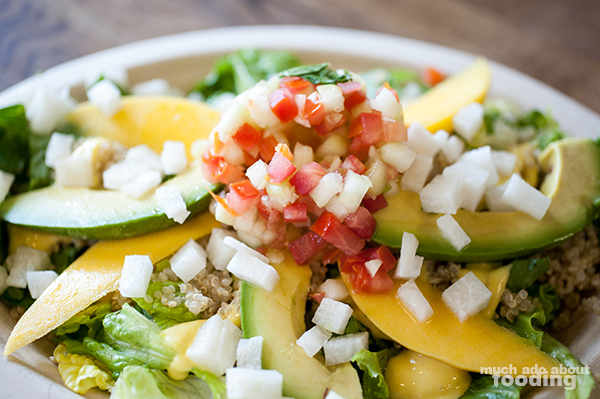 For her, the Mango Tango salad ($7.95 - rainbow quinoa on a bed of Romaine topped with jicama, tomato, and avocado drizzled in a mango dressing) was the choice. Though the presentation was beautiful, my taste of the dish seemed a tad lackluster. Perhaps the Romaine was too skimpy or the dressing too sparse. The vegetables were gorgeous however and the crisp jicama with crunchy mango made so much sense together. My choice was the Portobello Burger ($8.95 - grilled Portobello, marinated patty, aioli sauce, lettuce, tomato, and red onion drizzled with a balsamic vinaigrette), a thick burger of a meal that I had been curious to see. 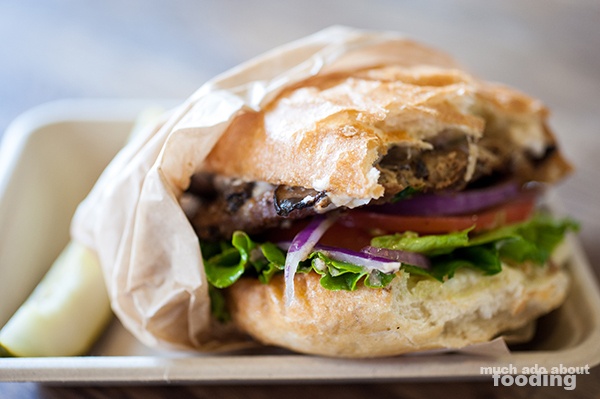 Most restaurants just grill up a fat mushroom and serve that as a patty but here at Healthy Junk, a flavorful patty made up of mushrooms was the star. 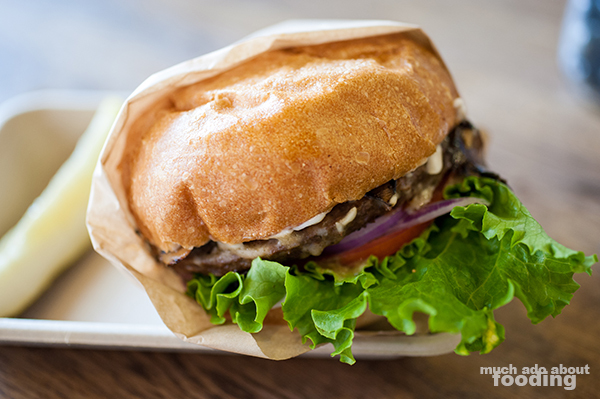 In fact, my friend who practically abhors mushrooms actually said that this burger could change her mind...maybe. Anyhow, the mushroom patty was topped with more mushrooms (I was in heaven - LOVE mushrooms!) and crunchy greens. I found myself nearly drooling over their aioli slathered all over my bun (that's not...wrong to say, is it?) and promptly dispensed of this wondrous burger. 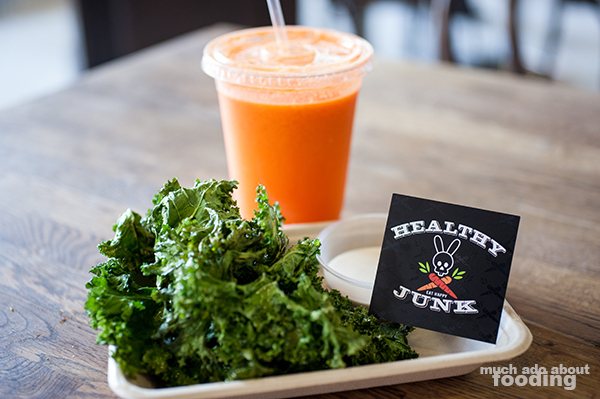 Well done Healthy Junk - I will be back!